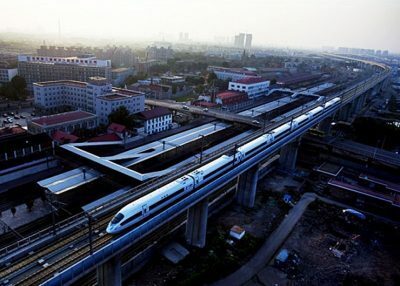 China’s plans to build high-speed rail connecting Kunming in its Yunnan province with the rest of Southeast Asia are already underway. In the landlocked nation of Laos, tunnels and bridges are already under construction. Beijing “encourages dependency using opaque contracts, predatory loan practices, and corrupt deals that mire nations in debt and undercut their sovereignty, denying them their long-term, self-sustaining growth,” said US Secretary of State Rex Tillerson on March 6. “Chinese investment does have the potential to address Africa’s infrastructure gap, but its approach has led to mounting debt and few, if any, jobs in most countries,” he added. Some call this “debt-trap diplomacy“: Offer the honey of cheap infrastructure loans, with the sting of default coming if smaller economies can’t generate enough free cash to pay their interest down. While nations should protect themselves from the dangers of being indebted to foreign interests, the US and supposedly international institutions like the International Monetary Fund and the World Bank are hardly innocent of wielding debt as a geopolitical weapon themselves. However, while some of China’s projects may be questionable, others offer tangible benefits not only for China, but for the regions they will be interlinking. The real concern in Washington, London and Brussels is regarding infrastructure projects that are successful, bringing profit and benefits to both Beijing and partner nations, allowing them to collectively move out from under centuries of Western primacy. Before Chinese investment picked up in Laos, the capital of Vientiane was diminutive even compared to nearby Thai provincial capitals. The sports utility vehicles of US and European nongovernmental organisations could be seen driving through the small city’s streets, some of which were unpaved. Banners bearing the UN logo encouraged local residents to turn off their lights, making an already eerily dark capital even darker at night. Campaigners funded by Western capitals attempted to obstruct earlier projects, including dams that would have created energy, expanded industrialisation, provided jobs and boosted the economy. Over the past decade, Chinese investment has seen highways built across Laos connecting its isolated capital with its neighbours. Vientiane has seen not only an uptick in Chinese investment, but from Vietnam and Thailand as well. The completion of a high-speed rail network connecting Kunming, China to Singapore, and passing through Vientiane, Laos, will bring even more people, goods and investments into the nation. The US State Department’s Radio Free Asia (RFA) media front in a special titled, “China’s Fast Track to Influence: Building a Railway in Laos,” attempts to leverage America’s favourite soft power tools, namely “human rights” and “environmental issues” along with warnings of debt to cast doubts on the project. The railway – which will eventually run from Kunming in southwestern China through Laos, Thailand, and Malaysia to Singapore – is a key component of China’s signature global infrastructure plan, the ambitious Belt and Road Initiative. China is now the top investor in Laos, and Chinese companies are pouring billions of dollars into Special Economic Zones, dams, mines, and rubber plantations. Beijing hopes the aid and investment will draw the landlocked Southeast Asian nation, a former French colony with close ties to its communist mentor state Vietnam, into Beijing’s orbit. The supposed alternative to Chinese-built infrastructure and real, tangible progress, of course, is for Laos to continue hosting US and European NGOs attempting to create parallel institutions to run the nation with before eventually replacing the ruling political order in Vientiane with a US and European-backed client state. Even as Laos begins to irreversibly exit from under the shadow of the West’s colonial past, the US and Europe are unable to offer any significant projects that actually provide Laos with an alternative route toward real economic progress. RFA’s article attempts to scrutinise government compensation for residents displaced by the project and point out supposed environmental issues tied to the railway, two vectors the US has often used to impede development in nations worldwide to prevent economic progress and competition to US preeminence. The US media is also attempting to encourage fears of a China it claims in the near future will overstep its bounds and trample its neighbours. While China will undoubtedly win significant influence in Laos and reap benefits from its infrastructure projects across the region, other nations across Southeast Asia will as well. The sort of primacy achieved by Europe and the US across Asia before the World Wars will be difficult, if not impossible for China to duplicate. While China does possess a powerful economy and is constructing a formidable military, the disparity in economic power and military might in the region today is not comparable to that which existed between Western colonial powers and their subjects in the past. The technological divide that had previously granted the industrialised West its advantage over the rest of the underdeveloped world has been bridged. The same technology China is now using to drive its manufacturing and high-tech industries are also being leveraged by other developing nations across Asia offering competition as well as a regional balance of power. This exposes the real fears Washington is currently dealing with, not a China transforming into a regional or global hegemon and threat, but a multipolar Asia that is no longer subjected to US hegemony or threats. Joseph Thomas is chief editor of Thailand-based geopolitical journal, The New Atlas and contributor to the online magazine “New Eastern Outlook” where this article was originally published.